Some 20,000 police officers and soldiers will be on hand as the trial of Egypt's ousted president begins on Monday. 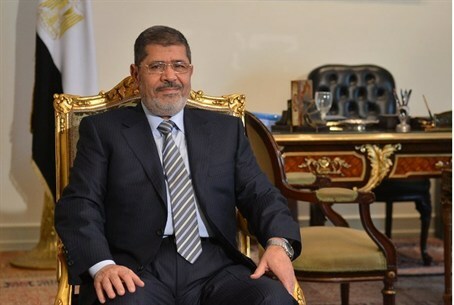 Egypt is on high alert as the trial of ousted president Mohammed Morsi is set to begin on Monday. The trial has prompted calls for mass protests, along with tight security measures, according to the website of the Al-Ahram newspaper. Morsi and 14 other members of the Muslim Brotherhood are due in court Monday on charges of incitement to murder and violence in the December 2012 presidential palace clashes, which pitched Morsi opponents against his supporters. On Sunday, the head of Cairo’s Appeal Court decided that the trial will not be broadcast live on air, and that photographers and journalists will not be allowed to attend, according to Al Arabiya. Egyptian authorities have also decided to move the trial of the ousted president to the Police Academy instead of the previously announced police institute near Cairo's Tora prison, reported Al Arabiya’s Cairo correspondent. If found guilty, Morsi and his co-defendants could face lifetime imprisonment or the death penalty. Tensions were running high across Egypt on the eve of Morsi's trial, which is expected to heighten conflict between the Muslim Brotherhood and the interim authorities, who have cracked down on Islamists since Morsi's ouster. Morsi supporters called for mass protests in the week leading up to the trial, as well as rallies on Monday in front of the Police Academy. The Muslim Brotherhood described the trial as an attempt by the current regime to put Morsi "behind bars, and fill Egypt with corruption, looting and authoritarianism." The National Alliance to Support Legitimacy (NASL), a pro-Morsi coalition backed by the Muslim Brotherhood, described the trial as a "farce" on Sunday, decrying what they call "illegal" measures against the country's first freely elected president. "The farcical, absurd trial the coup organizers are holding next Monday is nothing but a naive attempt to break our will and drain that of the resistant president," the Alliance announced in a Facebook statement quoted by Al-Ahram. "What is happening now is a flagrant breach of all standards, laws and norms," the NASL statement continued. It also lambasted the "disgraceful performance of the judiciary, which has become a tool in the hands of the military... used in a political conflict to crush rights and laws." The NASL statement called on "all Egyptians" to protest Morsi's trial, stressing that demonstrations will remain peaceful and "stronger than the [police] bullets." Heavy security is expected nationwide on Monday. Some 20,000 police officers and soldiers will guard the trial, reported Al-Ahram. On Saturday, Egypt's Interior Ministry declared that it will take all action within the boundaries of the law to combat violence during protests against Morsi's trial. Pro-Morsi groups have been staging demonstrations regularly since the army deposed the former president in July amid mass demonstrations against his rule. Daily "anti-coup" demonstrations have recently been held on university campuses, some of which have escalated into violent conflict. On Wednesday, police stormed the Al-Azhar University campus in Cairo to disperse student protests after clashes erupted with staff members. In August, police forcibly dispersed two pro-Morsi sit-ins in Cairo leaving hundreds dead. Since then, many of the group's members and dozens of its leading figures have been arrested, with some put on trial on charges of inciting violence.